See all project details at Block9Fargo.com. Block 9 also includes a programmed community plaza, over a half acre in size, which is anticipated to become a gathering and celebration space for the region. Plans include seasonal amenities such as a skating rink, splash pad, vendor spaces, and a band shell for live performances. Block 9 is not built on a dream for today. It is built on a dream for the next century. Created to fuel an already thriving community, while rising up to meet the future. The block has captured imaginations of people around the world as we’ve set out to dream of possibilities for the property. Held in 2010, Downtown Fargo: An Urban-Infill Competition garnered 160 design entries from 23 countries. Nearly six years later, a strong partnership has formed to turn the dream into reality. The downtown community plaza is designed to be a central place for the community to gather. Fargo Parks District will program the space to incorporate live music and kid-friendly events, and the green space will double as an ice skating rink in the winter. Partners in the project include R.D. Offutt Company, Kilbourne Group, and the City of Fargo. With a mutually beneficial public-private partnership, this empty slate will be transformed into a mid-rise, mixed-use tower that will add to a vibrant city core and change the skyline of downtown Fargo. The project includes corporate headquarters for hundreds of team members of R.D. Offutt Company, ground floor retail, a boutique hotel, and residential condominiums. Adding a new center of commerce into the heart of downtown creates more economic activity and opportunity for all. Bringing additional people downtown will have a positive impact on the growth of the neighborhood, its merchants, restaurateurs, residents, visitors, and other stakeholders. Read more in the February 6, 2016 Bismarck Tribune article, Downtown projects changing the game in Fargo, Bismarck. The east 200 block of Broadway, or Block 9, was a focal point for activity in downtown Fargo prior to the last few decades. 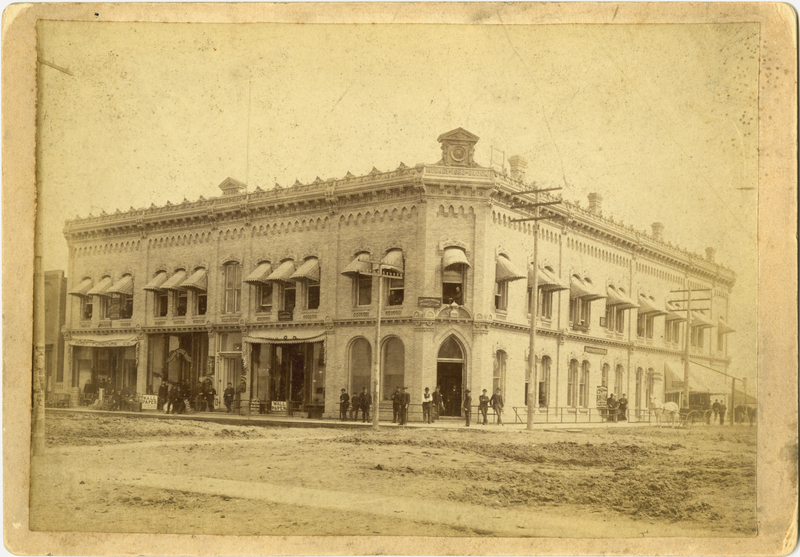 Before being destroyed in the Fargo Fire of 1893, the plot of land was home to the Hotel Boulger and Keeney Block, which housed a number of small businesses, including a Western Union telegraph office, real estate office, music store, law office, and more. Hotel Boulger was a popular hotel owned by Richard Boulger, an Irish immigrant who settled in Fargo. Keeney Block inhabited the southern section of the block, while the hotel inhabited the northern section. After the fire, the hotel was rebuilt, became Norman Hotel after a number of years, and eventually was home to Model Clothing House. Keeney Block was renamed Continental Block, and a variety of businesses thrived there until it was destroyed in another fire in 1976. Less than a decade later, around 1983, the former hotel was demolished to create more parking. Read more about the history of Block 9.